A while back yonder, we brought you some sweet preliminary sounds from Austin post-rock duo COSMS then-upcoming EP. That EP has done gone and come out, and we've got the whole thing for you here today! Arteria expands on the sound from pre-release, Asian-influenced instrumental track "Pagoda" with five total tracks of contemporary two-musician post-rock experimentation. It's a little weird to us who remember when Godspeed! You Black Emperor, Explosions in the Sky and the other post-rock of the 2000s was a wholly new sound, as now the genre is in a very different place. Most "indie" fans have moved to a pretty heavily psych-rock, indie-folk, synthy pop zone, and the massive underculture (does that even exist anymore?) attention has shifted away from genres like post-rock (you could include a lot of other genres like doom metal in there too). Personally, I think that's a great thing for bands like COSMS, because it allows them space to do whatever they want, to work on subtle changes and enhancements to their genre and to really get the sound they want down on record. The result is lovely gems like Arteria, with its Shanghai-meets-American post-rock sound, and its ultra pared-down two musician format that allows for each piece of their songs to be prominent, allowing the listener to really see how each part contributes to the whole. That's an approach that is quite nice in post-rock, especially when you think back to those 20+ piece tracks that Godspeed used to drop. As awesome as those were, they were going for something very different, something rougher and louder and more urgent, almost desperately so. 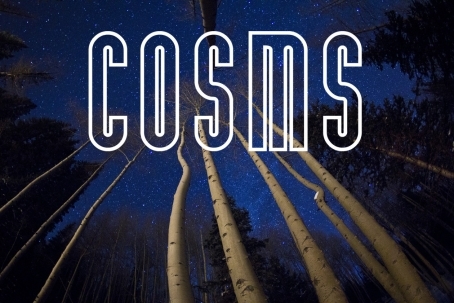 That was great for the time, but that COSMS has found a space to do something very different, and very lovely, in post-rock that's shows that the genre has much still to offer. In all these are some fresh-layered tracks with delightful complexity in the song structure from but two musicians, and you won't find tighter instrumental music coming out of Austin. Listen to all of Arteria below y'all.